As a rule, free navigation applications for your Samsung Galaxy S9, like Google Maps Navigation, have real-time updates that avoid taking you on congested routes. This is very handy, particularly in urban areas. However, if that isn’t enough for you, you can also upgrade to have 3D images that provide better context for landmarks. 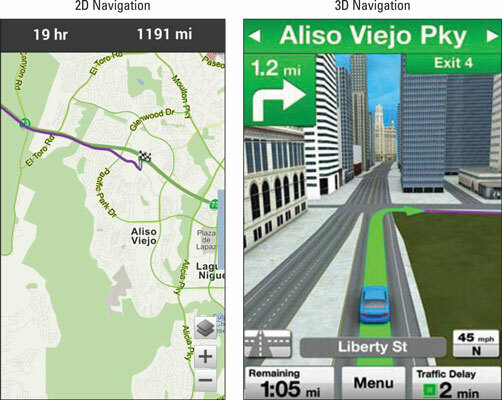 Comparing 2D navigation to 3D navigation. As you can see in the figure, the 2D map is perfectly usable and accurate, but the 3D map gives you context and additional information about the buildings around you, which can give you an extra level of confidence. This comes at a small price premium. So, if you frequently depend on your mapping app to get where you’re going, you may find it worth your while to spend money for a paid app. This amount is relatively modest compared to what you’re paying monthly for your service. The price of a dedicated GPS receiver, with almost exactly the same capabilities, is between $125 and $200. The monthly cost of the service is comparable to the one-time fee of the GPS receiver. Plus, you don’t have the hassle of lugging an additional device and its wiring. Sometimes the app gives audio instructions. The Google App has a speaker icon that appears on the map that allows you to turn audio instructions on or off.